Boyd Glass - information from the Glass Encyclopedia. Bernard C Boyd and his son Bernard F Boyd formed Boyd's Crystal Art Glass in 1978 in Cambridge, Ohio. The company was formerly Degenhart's Crystal Art Glass, and when Elizabeth Degenhart died in that year, she stipulated in her will that Bernard Boyd Senior, who had worked for her as a glassmaker, should be given the first option to buy the factory. He bought the factory and the molds, all except for 15 molds that Elizabeth wished to see retired and preserved. The Degenhart trademark of a heart and a D was removed and replaced with the new Boyd traidemark, the diamond B (shown left). Boyd's Crystal Art Glass is very much a family concern. Bernard C Boyd died in 1988, but his son Bernard F and his grandson, John Bernard Boyd, took over running the company. Sue Boyd, Bernard's wife, worked in the company every day, and her daughter, Debbie, was also closely involved. The company made small collector's items in a wide range of colors in art glass. Bernard F Boyd and his wife retired in 2014. The Boyd molds were sold, but with the B trademark removed. And in December of 2014 the Boyds reported that a dealer had bought the entire remaining stock of Boyd glass items. They had no more glass to sell. If the Boyd "diamond B" trademark is completely enclosed in a rectangle, like the third example on the left, the piece was designed between 1998 and 2003. If there are no lines around the diamond, the piece dates from 1978-1983. From 1983-1988 one line was added underneath the diamond, like the second example on the left. A line above as well as below indicates 1988-1993; and three surrounding lines were used from 1993-1998. The example with a B in the top left triangle dates from 2003-2008 and the one beside it with a B and an O dates from 2008-2014. 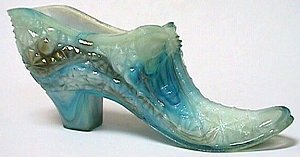 Below are some more examples of Boyd glass. 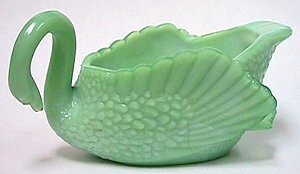 The company produced some 300 different colors of glass, including vaseline glass, carnival glass, and every color of the rainbow. If you are looking for Boyd glass, you can usually find a selection on offer on ebay - click here to see the Boyd glass currently for sale on ebay. The Boyd company closed in 2014 but their website still (2016) shows a set of pictures illustrating their many colours, illlustrations and dates of their various trademarks, and a list of all their molds with the dates and colours they were made. Click here to go to their website. There is a section that includes Boyd glass in each of these books. Click on the book cover or title to read more about that book. Boyd's Crystal Art Glass (1981) by Bernard Boyd. 32 page booklet giving the history of the company, three coloured pages of photographs and details of all the models, dates and colours. 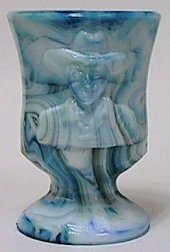 Boyd's Crystal Art Glass of Cambridge, Ohio (2000) by The Boyd Family. Here are some books we think you may be interested in. Click on the picture to read more, click on the arrows to make the carousel go round.